Welcome to October! 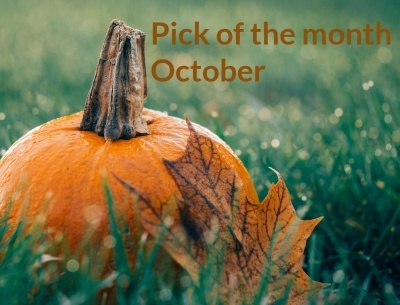 Month of falling leaves, crispy apples, giant pumpkins and spooky goings-on! Libraries Week happens this month - a chance to celebrate the fantastic free resources that we have on our doorstep. Events are running at libraries across Hertfordshire, but at Harpenden library you can enjoy a special Toddler Tales featuring Angry Cookie Tales on Tuesday 9th October and an all-day storytelling event for all ages (including Baby Rhyme time) on Thursday 11th October. Later in the month on Tuesday 30th October there will be a special Spooky Stories for under 8s and children are invited to come in fancy dress! This year is the 50th anniversary of the film version of Lionel Bart's Oliver! This month you can enjoy it live on stage at our very own Harpenden Public Halls when Harpenden Musical Theatre Company and a cast of local children bring it to life on 9th - 13th October. Featuring all the favourite characters and well-known songs this is definitely a show for all the family! Also taking place this month is the annual Fun Palaces event, which campaigns for culture for all. Amongst the venues taking part this year is the Trestle Theatre at St Albans Museum on Saturday 6th October. On offer will be a range of workshops and taster sessions including crafts, yoga, hand-on science and more all around the museum. You may have already noticed that Hertfordshire schools have a different half-term to the surrounding counties this year, so half-term events at venues in neighbouring counties are taking place the week before our holiday. But if you have younger children who are not yet school age, or if your child attends a school that is having a longer break then you will be able to take advantage of two weeks of activities and events! If you are looking for places to take part in some pumpkin carving (amongst other spooky activities) then try Pumpkin Festival at Willows Activity Farm, Spooky Pumpkin Carving at Aldenham Country Park, Pumpkin Scooping at Ayletts Nurseries, Carve a Pumpkin at Mill Green Museum, Boo at the Zoo at Whipsnade Zoo, Freaky FunFest at Mead Open Farm, Howl-o-ween at Paradise Wildlife Park, Halloween Treat at Herring Green Activity Farm or Ghosts Ghouls and Goings On at Wrest Park. And if you prefer to carve your own then you'll want to know that the Pop-up Farm is open for PYO pumpkins 6th & 7th October, 13th & 14th October and 20th-31st October, 10am-4pm. Have a spoooook-tacular time this month!